11 Awesome Petting Zoos for kids-of-all-ages! Did you ever see a Mom pushing a stroller down the street in one direction while a pet owner is walking a dog in the other? When the dog and child pass their eyes meet, the child smiles, the dog wags his tail. It's as if they share a secret language or belong to an exclusive club. 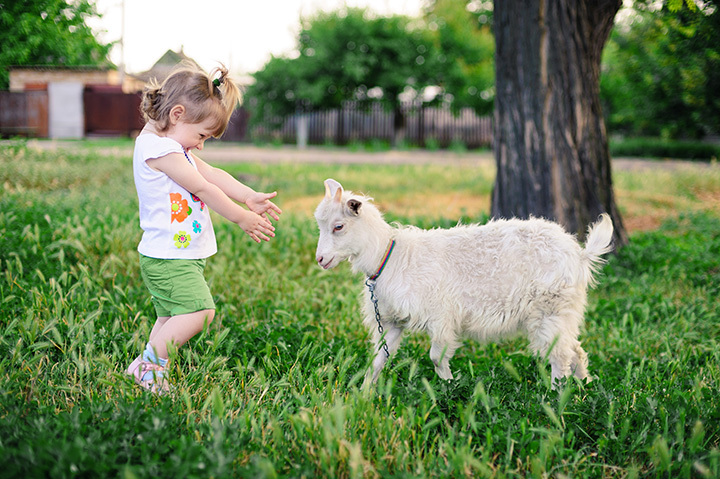 Children are often drawn to animals, especially young children to small animals, which is why petting zoos are a wonderful way to help educate children about the animal kingdom. The Philadelphia Zoo was the first zoo to open to the public in 1874 with a children's zoo in place. Today, most petting zoos can be found as part of larger zoos, with opportunities for children to get up close and touch the animals. Just remember to wash your hands well to avoid picking up germs. San Diego is known for their world-class zoo and while they don't have a petting zoo, they do have Animal Encounters, which are select programs that give you a closer vantage point and better perspective of some of the wild animals like Elephants, Lions and Jaguars. You can purchase a ticket on the weekends to feed the Giraffes or enter the Petting Paddock to feel the thick wool of a Sheep or "comb a gentle Pygmy Goat's hair." Nearby in San Diego is another family-favorite attraction called Pony Land where children can ride ponies, the family can take a wagon ride and everyone can enter the petting farm to meet the Ducks, Goats, Llamas, Peacocks, Pigs, Rabbits and a giant Tortoise! The Denver Zoo started with a gift of an orphaned Black Bear cub to the Mayor of Denver in 1896. He in turn gave the bear to the keeper of the city park who added more animals in a haphazard manner until in 1906 a formal renovation was undertaken. It was then that a zoo director was appointed who adopted the concept of viewing animals in their natural habitat and outside of cages. The Denver Zoo continues to deliver on its promise of providing extraordinary experiences like Up-Close Animal Encounters, Backstage Experiences for Juniors and Bunk with the Beasts CampOUTS. The Llamas have been known to line up for a photo opportunity at Silverman's Animal Farm, which is also a pick-your-own farm and farm stand. It was founded by Ben Silverman in the 1920s and is known for the apple cider that Ben made for more than 60 years and where he welcomed school children and families to watch the cider being pressed. The orchards and farm market attract visitors from the end of March until the end of December and the animal farm adds to the charm of a day spent in country. Check in with the Alpaca, Buffalo, Emus and exotic birds before picking up a pumpkin or pie to munch on. Picnic tables and washing stations make parents happy and birthday parties and school groups can be arranged. Check their website for seasonal attractions and special events. Florida is the land of unforgettable attractions like Disneyworld, Universal Studios and the Lowry Park Zoo, voted tops by media and Moms. The mission of the zoo is "to connect people with the living earth" and they do that with a focus on conservation, education, research and recreation. More than 1,200 animals live among the lush, tropical gardens set on 56 acres in Tampa, Florida. The state of Florida recognized Lowry as a center for biodiversity and conservation in 2004 and their Zoo School is a "hands-on learning facility with a lecture hall and 13 classrooms that educate more than 170,000 children each year." Family Play Programs are just one of the ways children and animals get together at the Hamil Family Play Zoo. You must register for one of these coveted classes that connect children to wildlife, but it's worth it. The permanent residents you can visit during a Hamil Family Wild Encounter include Alpacas, Wallabies, (similar to, but smaller than Kangaroo), Goats, Llamas, Red Pandas, Reindeer and hundreds of species of Parakeets from all over the world. This new exhibit, opened in 2015 gives children a chance to touch and feed the animals as well as get up close with the park's Animal Ambassadors whose handlers are on hand to tell their story, answer questions and facilitate connections. The Catskill Game Farm used to be the premiere destination for a petting zoo experience, but since they closed their doors in 2006, places like the Long Island Game Farm Wildlife Park and the White Post Farm Animals Farm both on Long Island, have taken up the slack. At both places you can hand feed the animals, but the Long Island Game Farm is considered the largest combined Wildlife Park and Children's Zoo on Long Island where you can see many of the animals in natural environments. The Long Island Game Farm was founded in 1970 by the Novak family and continues to be run by the family who welcome thousands of children each year some with their families and others with school field trips for their first-time encounters with wildlife. At the Lazy 5 Ranch you can take a wagon ride tour that lets you stop and feed the animals along the way. The Lazy 5 is a drive by animal park where people can get especially close to Zebras, Giraffes, Ostriches and even a Rhino! They have 70 wild species, many which are free to roam the grounds and mix it up with each other and the tourists. The Farm at Walnut Creek gets high marks for its country charm and pastoral setting. It's a working farm that changes with the seasons offering sleigh rides in the winter and meet and greets with their farm animals most days of the year, and by reservation only from November through March. Drive through or reserve a wagon ride tour to view and feed the hundreds of animals who live on the farm. Call ahead to check the schedule and stop at the bank beforehand. The Farm is in Ohio's Amish country, where life manages to exist without electricity, and they don't accept credit cards and are closed on Sunday. The Garold Wayne Interactive Zoological Park is not your average zoo or park. It was built in honor or Garold Wayne and is now a park where all of the animals are living memorials to humans who have passed. Anyone can dedicate a habitat and then come visit to see how well cared for the living memorial is. Wayne loved all animals and it was his dream to visit a jungle, so his family is dedicated to bringing the jungle experience to others. Some of the animals have been rescued from people and places ill equipped to care for them and are all the more grateful for the paradise they live in now. You can choose from a number of levels of tours, including an Endangered Species Tour or pay extra for an experience like Private Play Time With Baby Animals. Donations and local elbow grease help keep the Bluebird Gap Farm a family-friendly green space that spans 60 acres and includes a nature trail, duck pond, picnic area, playground and a sheltered pavilion for parties! All of the usual farm animals are enjoying their freedom and the beauty of their surroundings. You can escape to this bucolic location to enjoy quality time with children and animals without a cover charge. Just remember to bring change for the animal feed machines. The Kids' Farm exhibit at the Smithsonian National Zoo was such a success it continues to be funded by the State Farm Insurance Company at least until the end of 2016 giving kids a chance to meet and even groom some of the animals. Head into the barn to mingle with the Alpacas, Cows, Donkeys, Goats and Hogs and plan your trip for April, when Kids' Farm has activities on tap for each day, including demonstrations and entertainment. April is also prime Cherry Blossom viewing timing in DC-a perfect time to visit our nation's capital.